The Bartlett will celebrate the centenary of The Bartlett name in 2019 with a year-long programme of events and a new website that reveals a producing new story every day for 100 stories over 100 days, exploring the past, present and future of The Bartlett. Bartlett 100 will shine a light on the people and projects that have shaped The Bartlett and the world around it, the moments that have made the institution, and how its research continues to contribute to the way that we design, model, build and govern human spaces. 2019 marks 100 years since Sir Herbert Henry Bartlett, a civil engineer and building contractor, donated £30,000 to fund a new building to house the School of Architecture and consented to the department being renamed in his honour at UCL after he and founded the two chairs in the School of Architecture and the School of Planning. Today, The Bartlett is a globally-active faculty that brings together 12 Schools and Institutes that train new professionals for careers in the built environment, studies the global impact of their activity and sets the agenda for the future development of the sector. 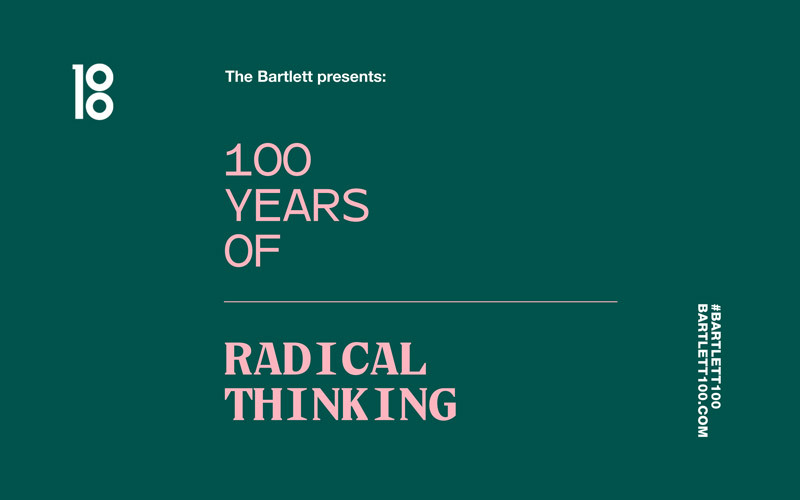 “Bartlett 100 will use 2019 to explore the radical thinking and projects that have characterised The Bartlett for a century. However, our intention is not to dwell too long on where we have come from, but to map out where we might go. To solve the problems of the 21st century, we need to be able to imagine radical new futures. This is not your typical review of past achievements. Through articles, essays, photo stories, interviews and archive materials, as well as events across 2019, over 100 days, our aim is to give you an insight into how our unique ecology has allowed us to adapt and grow around research questions, to embrace uncertainty rather than recoil from it to help build a better future for us all. The Bartlett has grown to be one of the most highly-regarded centres for the study of the built environment in the world. The work of the faculty has expanded to cover all categories of human space: physical structures like homes, building and cities as well as the invisible structures that govern them, the political and legal systems, financial frameworks and social norms. By combining design, history and theory across subject areas, The Bartlett is working to understand the structures shaping society today – and to make the world fairer and more prosperous.